This reducer helps control the flow of product from our 3ml and 5ml glass bottles (Part #'s 74249, 74250, 74251, 74252, 74253, 74254). To be used with the corresponding screw caps. These 5 ml glass bottles are used for sampling or storing small quantities of liquid formulations like aromatherapy and CBD oils, serums and foundation. Fits with corresponding dropper caps, screw caps and reducer (Part #'s 74257, 74258, 74259, 74260, 74261). These glass dropper caps fit our 3 ml glass bottles (Part #'s 74249, 74250, 74251), which are ideal for sampling or storing small quantities of liquid formulations like aromatherapy and CBD oils, serums and foundation. 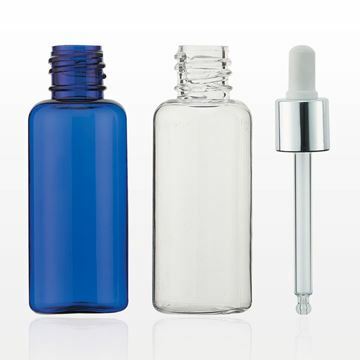 These glass dropper caps fit our 5 ml glass bottles (Part #'s 74252, 7253, 74254), which are ideal for packaging liquid formulations like aromatherapy and CBD oils, serums and foundation. These polypropylene screw caps fit our 3 and 5 ml glass bottles (Part #'s 74249, 74250, 74251, 74252, 7253, 74254), which are ideal for packaging liquid formulations like aromatherapy and CBD oils, serums and foundation.